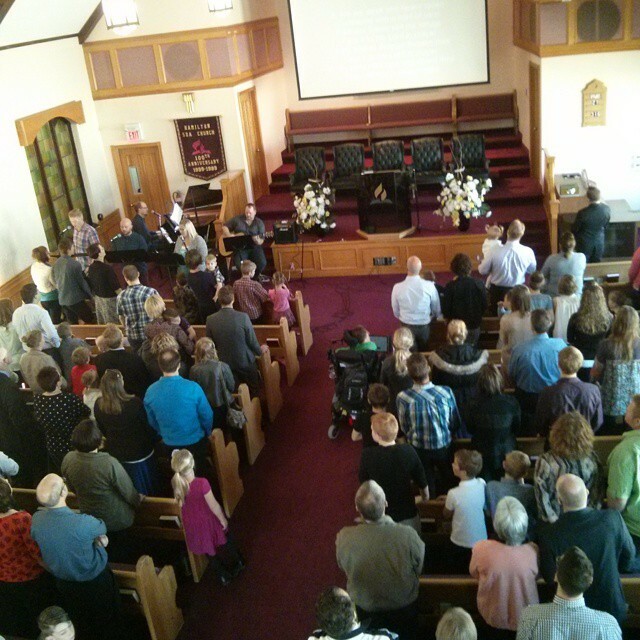 Blessings Christian Church is a vibrant, new church in the city of Hamilton. Our mission is to serve God as a faithful church, serve our city with Christian charity, and to bring the gospel to others in Hamilton. We're excited to serve our city. God is doing incredible things through the power of his gospel. Many people in Hamilton are experiencing spiritual renewal, while many others are still looking for answers. We are committed to reaching out to our city to make Jesus known, and to be a community where committed Christians can gather together to worship. Are you looking for a church in Hamilton? Read more about us. Sunday worship is foundational for Christian life. We meet for worship every week at 10:30 am and 6:30 pm. We invite you to come early and enjoy a coffee before our morning service! Directions can be found on this page. There is parking available, either at our building or on the streets around the church. We have welcome team members at every entrance who can answer any questions you have and direct you to wherever you need to go. We get a lot of visitors so you'll easily blend in. There is a nursery for infants and toddlers; and our Calvary Kids program is geared towards children from pre-school and up. There is a collection during our worship service. This is not for the church budget – all Sunday collections are for supporting the needy and other Christian acts of charity in our community. As our guest please do not feel obligated to put money in the offering. All the Bible passages and music used during the worship services will be projected. You are fully equipped to worship with us without having to bring anything. After every service there are prayer team volunteers available to pray with you. If you desire to make use of this program, you'll find the prayer team at the front of the church following the service. Our small groups are made up of approximately 10 adult believers who gather together weekly in someone's home. God designed us to live in communion with others, and small groups are an ideal place to assist each other in our spiritual growth. Our members meet together in small groups to enjoy each other's fellowship, study God's Word and spend time in prayer for each other. This is a wonderful time of worship with a smaller group where fellow believers can learn from and strengthen each other. If you are getting to know us and would like to benefit from a small group, we would love to find a small group that fits you. We have small groups meeting almost every day of the week, so we can work with your schedule. Our church is privileged to have many guests each Sunday. We welcome everyone. If you are not currently a Christian but would like to learn more about what the Bible teaches, we welcome you to visit our worship services. If you desire more information, our pastor or welcome team will be available to talk to you. If you are a Christian and are looking for a faithful church in Hamilton, we'd love to see you as well. If you become a regular visitor and would like to learn more about Jesus or our church then we would love for you to participate in one of our inquirers classes. This is a great opportunity to learn more about the gospel message. We believe God calls all believers to join a faithful local church. The first step in becoming a member of Blessings is to get in touch with our team of elders. The elders will meet with you and guide you through the process. Professing your faith in Jesus Christ. If you have not been baptized, this will be done upon your profession of faith. If you have already publicly professed your faith in another church, you can be admitted as a member after meeting with our elders and discussing your faith with them. Transferring your membership from another church of like faith. This is typically done by asking your previous church to provide you a letter of attestation that you can bring to us.